Hindering game-flow or providing depth? March 2 is Old Stuff Day, and this is my contribution. Here you can find the comments to the original post. This is one of those post I just have to write. Tenkar posted a question a few days ago about whether NPCs should be used as a a GM's mouthpiece or not [edit: for future reference, Tenkar's second post on the matter]. In the comments a few people were rather unequivocal about how using such NPC's was sloppy game-mastering. I have to admit that that riled me a little. Since I have a soapbox available, I'll now climb up on it. In my opinion, NPCs are the bread and butter of game-mastering. They are what makes the setting into more than a pimped up Monopoly-board, with the character sheets filling the role of little cars and fancy top-hats. They are everybody else. And all these people are played by the person sitting at the end of the table - the GM. Both the GM and the players comes to the table to play a game, and I believe that regardless of the style of play, the above premise holds true. I acknowledge that the role of the NPCs may vary according to gaming philosophies, but I still think there are certain mechanics inherent in the game. To argue this, I'll start by looking at three major philosophies in modern roleplaying. The first I'll address is the Sandbox. In this game, the world is created, be it by the GM or by a third party. NPCs, monster-lairs, dungeons, adventure-locations and cities are placed on the map, and the encounter-tables are stocked. The players then create their characters, and start exploring the world. They hex-crawl, they dungeon-crawl, and they kill monsters, solve puzzles, loot and gain experience. Most hard-line sandboxers I am aware of view any direct leading by the GM as a faux pas, and I am assuming that it is in this camp that most of the most vocal opponents to having NPCs act as GM mouthpieces belong. In the other end of the spectrum there is the Railroad. This may not be a philosophy in the strictest sense of the word, but more of a style. It is also commonly viewed as sloppy game-mastering, all across the board. Urban Dictionary defines railroading as, "to coerce, trick, or seduce others into a course of action they would not otherwise choose. [*]" Most roleplayers resent being railroaded, and justly so. Lastly I'll look at Storytelling. This style of play was made famous with the various White Wolf lines, and builds on a level of trust between the game master and the players. The rules are placed in the back seat, and the focus is placed on the narrative, rather than the game. The game master, or as the technical term is, the Storyteller, is not only advised to, but is expected to overlook any rule that will impede the flow of the story. There are no encounter-tables in Storytelling games. Before I continue, I should point out that I count myself among the last group, although I started my game-mastering playing AD&D 2nd Ed. Now to the NPC as the GM's mouthpiece. 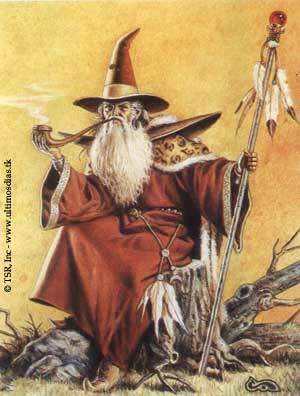 In Tenkar's post he was referring to characters such as Gandalf being the game master's mouthpiece, had LotR been an RPG campaign, akin to characters such as Elminster of Forgotten Realms. I also surmise that those who spoke against employing such characters were using the same definition. And this is where I don't agree. As a storyteller, I believe that every single NPC is the game master's mouthpiece, if for no other reason than that the game master speaks through every single NPC. Whenever a PC addresses someone not represented by a given person at the table, the game master will play out that role. If the NPC conveys a rumour about marauding goblins in the Northern Woods, it is in fact the game master speaking. The same goes for any information, or lack thereof, any NPC gives to any player. I see that in a Sandbox-purist's game, an ancient, powerful, and wise NPC giving advice may be seen as instructing the PCs as to how to proceed, and that this may impede the open nature of the sandbox. In my view, however, removing any such influence say more about the setting than anything Gandalf might come up with. Are there no older, wiser characters in the world? Why so? If they exist, why aren't they taking an interest in what's going on in it? Is it beneath them? Or is it that they are working against whatever side the PCs are on? As I've said, I view every NPC as a game master's mouthpiece, by virtue of the fact that as a game master, they speak with my mouth. Therefore I try to make sure my NPCs all have their own goals and agendas, and that I know what they know, and from where they learnt it. That way I the players will be able to get different information and advice from different NPCs. I also believe that without any wiser, older, more powerful, and/or more informed characters inhabiting the world, the world becomes less believable. Even epic PCs will not know everything about the world by virtue of the fact that it is the game master who ultimately decides what lies around the next bend. Asking even the lowliest peasant may reveal information vital to bringing the story to its next stage, and even the lowliest peasant is the game master's mouthpiece. This is not railroading, this is game mastering and storytelling. Even if the players have access to the source-material, the game master is still the one calling the shots when it comes to which adventure is open for play. My question is, how can the PCs gain any information about the setting, regardless of whether the game is a sandbox, a railroad, or a story, without interacting with the world as presented by the game master? I think this is one of those situations where people's conception of "x" is rather ungenerous reading not necessarily impiled by the use of the term. What angers people is DM pet NPCs that become the focus and deprotagonize the players. I don't really see how an NPC merely being used to convery info to the players could be problematic to anyone. A ancient wizard can say what he wants. It would only be coercing the PCs to follow his dictates that would violate the sandbox. I agree. We can't have powerful wizards violating sandboxes. Its just not right. But on a more serious note, I think it all comes down to good or bad game mastering. I can even see scenarios where it would be appropriate for Master Überbad to dictate a set of actions. "Retrieve my ring from the Hellpit, or else..." should be allowed to remain a valid start of an adventure. Denying the NPC's request to his face would mean a confrontation with a lethal opponent, but once the heroes have left, they stand free to choose their path. But as with all things, if used in excess it becomes dreary.